Okay, it’s a bad picture, but I took it and now everything is bandaged, so that’s that. 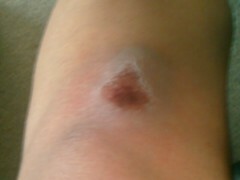 I fell on the road and slipped halfway across it! Talent is what that is. sigh… and you always say I’m being silly when I tell you to be careful about becoming a bathroom statistic. Ouch! It must smart. I want to ask how but I don’t think I’d get it anyway. :P Listen to Tigs. It may sound funny, but don’t think he’s joking. Where’s Yut when you need him to catch you from falling?? i always think you’re talented when it comes to these things. remember when we all went skiing (maybe back in 1999?) and we were at the bunny slope b/c none of us knew how to ski, and you somehow managed to generate enough momentum down the bunny slope to keep on going and going down the hill until you reached the bottom and managed to slide UNDERNEATH the fence — the fence that kept *most* ppl from going into the parking lot??? And then there’s all the times when she’s just slipping and sliding down the sidewalk like there’s ice on the ground, in Berkeley.